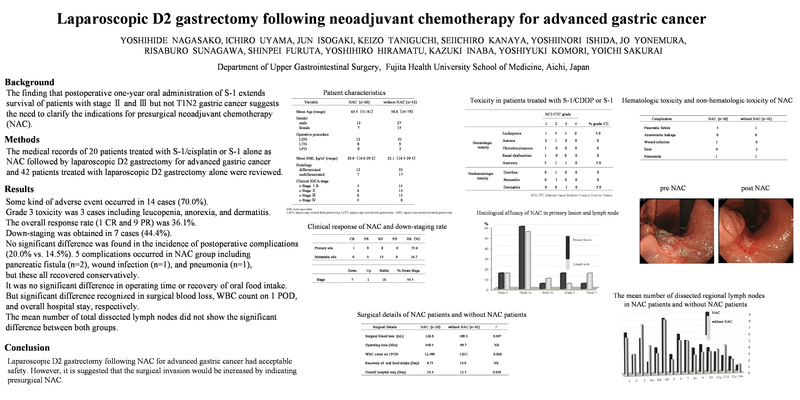 yPurposezIt is considered that the laparoscopic lymph node dissection for gastric cancer after chemotherapy (neo-adjuvant chemotherapy; NAC) is a little difficult in technique. We attempt to laparoscopic D2 lymph node dissection after NAC, from the experience of over than 500 cases of laparoscopic gastrectomy for gastric cancer in our department. We report on the short-term result of laparoscopic gastrectomy with regional lymph node dissection for advanced gastric cancer after NAC. yMaterials and MethodszSubjects were 8 gastric cancer patients who administered TS-1/CDDP as NAC between July, 2005 and July, 2007. It includes 1 case for c-Stage1, 1 case for c-Stage2, 5 cases for c-Stage3A, and 1 case for c-Stage3B. TS-1 80mg/m2/ 3 weeks and CDDP 35mg/m2/ in day 8 were administrated, that was assumed to be 1cycle and operation was conducted after 2cycle of NAC, in principle. Operation types were six cases of laparoscopic distal gastrectomy, and two cases of laparoscopic total gastrectomy. yResultz Histopathologically grade 2 efficacy or more were obtained downstaging in three cases. The amount of intraoperative bleeding was 110.1g on the average, and the total operation time was 352 minutes on the average. Concerning postoperative complication, prolonged ascites appeared in one case, but it recovered by conservative therapy. All cases are surviving up to now, but in two cases, it appeared with peritoneal recurrence. yConclusionzAfter using NAC of TS-1/CDDP together, laparoscopic D2 lymph node dissection was able to be enforced safely. We conclude that a further investigation and a long-term observation are necessary in the future.